THE New Zealand dollar touched a fresh five-year high against its trans-Tasman counterpart overnight as economic data strengthens expectations Australia may cut interest rates further, increasing the yield appeal of New Zealand's currency where interest rates are set to rise. The kiwi touched 90.86 Australian cents overnight, and was trading at 90.61 cents at 8am in Wellington, from 90.34 cents at 5pm yesterday. The local currency edged lower to 81.79 US cents from 81.86 cents yesterday after better than expected private jobs figures yesterday. The Australian dollar was the worst performer overnight as weaker growth data increased bets the Reserve Bank of Australia may cut its benchmark rate from a record low 2.5 percent. In comparison, stronger economic data in New Zealand means the nation's central bank is likely to raise its benchmark rate next year, increasing the yield appeal of the local currency. "The expectation that the Reserve Bank of Australia may have to cut rates and that the Reserve Bank of New Zealand wants to hike rates in New Zealand is all that is driving it," said Tim Kelleher, head of institutional FX sales in New Zealand at ASB Bank. "The yield curve is the key driver - the money goes where it can get the best return." A report yesterday showed Australia's gross domestic product grew 0.6 percent in the three months ended Sept. 30, missing the 0.8 percent growth forecast in a Reuters poll of economists. Weaker economic data in an environment where the RBA wants a lower currency is putting pressure on the Aussie, Kelleher said. 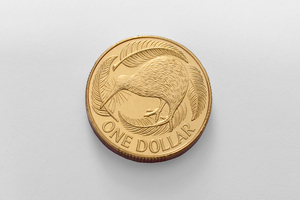 The kiwi, which has traded in a range of 75-95 Australian cents over the past 20 years, could reach 92 to 93 cents over the next two to three months, Kelleher said. In Australia today, traders will be eyeing a report on trade for October at 1:30pm New Zealand time. The New Zealand dollar slipped to 83.40 yen from 83.98 yen yesterday. The kiwi edged lower to 60.19 euro from 60.26 euro yesterday. The European Central Bank is expected to keep its benchmark rate on hold at its meeting today after unexpectedly cutting its key interest rate to a record low 0.25 percent last month. The local currency was little changed at 49.93 British pence from 49.96 pence yesterday ahead of a Bank of England policy meeting today where rates are expected to remain on hold. The trade-weighted index slipped to 77 from 77.08 yesterday.